We’re getting to the time of year when Bethlehem’s First Fridays are really good. Nice weather means more people, and First Fridays are definitely a “the more the merrier” monthly event. 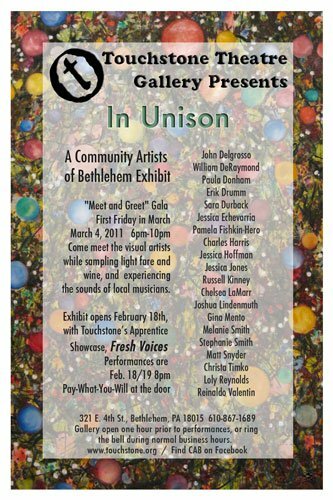 Kicking off March and what we can all hope is the start of more consistent sunshine is a great show put together by the Community Artists of Bethlehem (CAB). In Unison came to fruition when the folks of CAB and Touchstone Theatre realized their creative brains and resources should merge together. 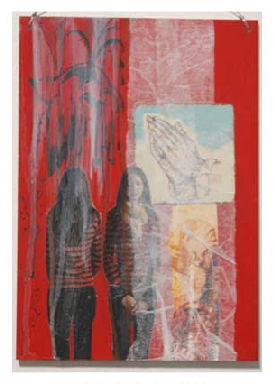 When CAB put out a call to interested artists, the response was large enough that the show now boasts more than three times as many artists as were initially considered. Art will run the gamut from paintings and photography to mixed media and wire sculpture. “You can expect to see pieces that range from extremely disciplined to those that are a bit fringier”, Loly says. CAB is a grassroots organization that you’ve likely seen at almost all of Bethlehem’s festivals. Loly explains, “The purpose of CAB is to encourage communication between area artists and widen their network to promote exposure to their work and create a positive cultural impact on our wonderful city. Many of these artists are active in the arts community through Blogs, Drink and Draw’s at The Brew Works, local businesses, as well as Lehigh and Moravian graduates”.